SALT LAKE CITY, Sept. 13, 2018 (GLOBE NEWSWIRE) -- InvisibleShield®, a ZAGG Inc (NASDAQ:ZAGG) brand and the leading global innovator in screen protection, today announced InvisibleShield Glass+ VisionGuard™ for the Apple iPhone Xs, iPhone Xs Max, and the iPhone XR. Glass+ VisionGuard features protective EyeSafe® technology that filters out portions of the harmful high-energy visible (HEV) blue light spectrum emanating from device screens while maintaining the superior color performance of your device display. InvisibleShield Glass+ VisionGuard defends against harmful high-energy visible (HEV) blue light and promotes better eye health while providing the powerful impact protection for which InvisibleShield is known. A photo accompanying this release is available at http://www.globenewswire.com/NewsRoom/AttachmentNg/16a04650-c2c7-4fb3-9ba7-e0b83018fecb, and a product video is available at https://youtu.be/JyxMAOBjb_I\. According to The Nielsen Company1, the average adult now spends more than 9 hours per day on screens. According to The Vision Council, people normally blink 18 times per minute on average. Using digital screens causes blink rates to drop, resulting in dry, itchy or burning eyes, the symptoms most commonly associated with digital eye strain. HEV blue light reaches deeper into the eye which may damage the retina2. Additional research also points to a link between HEV blue light and long-term vision issues including age-related macular degeneration3 and cataracts, leading causes of blindness. As we use devices more, our exposure to HEV blue light increases. HEV blue light has been shown to contribute to digital eye strain which can cause dry and irritated eyes, sleep disruption and loss, blurred vision, and premature eye aging, especially in children. Glass+ VisionGuard filters harmful HEV blue light from your device screen with a protective EyeSafe layer while providing the powerful impact protection for which InvisibleShield is known. Featuring Ion Matrix™ technology, Glass+ VisionGuard is strengthened at the molecular level and preserves the glass-like feel of your device screen, offering edge-to-edge protection with remarkable touch sensitivity and image clarity. Glass+ VisionGuard joins a full suite of InvisibleShield screen protectors available for iPhone, including the all-new InvisibleShield Glass+ Anti-Glare, featuring a matte finish that blocks light from reflecting off of device screens and a smudge-resistant coating that keeps devices clear of fingerprints. For more information on the complete screen protection product lineup available for the next generation of Apple devices, please visit InvisibleShield.com. InvisibleShield Glass+ VisionGuard will be available on InvisibleShield.com, Verizon, and T-Mobile locations nationwide for $44.99. InvisibleShield Glass+ Anti-Glare will also be available on InvisibleShield.com for $44.99. 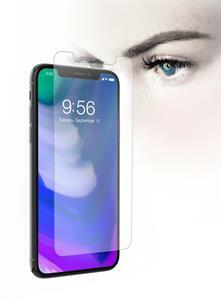 As always, InvisibleShield backs its screen protectors with an industry-leading limited lifetime warranty and will replace the InvisibleShield if it ever gets worn or damaged for the life of the device. For details and more information, visit InvisibleShield.com. With more than 165 million screen protectors sold worldwide, InvisibleShield is the No.1 selling brand for smartphone screen protection in the U.S.4. InvisibleShield has set the industry standard for screen protection. InvisibleShield, the InvisibleShield logo, ZAGG, VisionGuard, and Ion Matrix are trademarks of ZAGG IP Holding Co., Inc. Healthe and EyeSafe are trademarks of Healthe LLC. Apple and iPhone are trademarks of Apple Inc. Vision Council is a trademark of the Vision Council of America, Inc.
InvisibleShield is the No. 1 selling industry standard and category creator for screen protection with more than 165 million screen protectors sold worldwide. Committed to empowering consumers to fearlessly enjoy their devices, InvisibleShield provides premium, lifetime protection against scratched, cracked and shattered screens through its military-grade solutions. InvisibleShield is based in Utah and has operations in the United States, Ireland, and China. InvisibleShield products are available worldwide and can be found at leading retailers including Best Buy, Verizon, AT&T, Sprint, Walmart, Target and Amazon.com. Visit ZAGG.com and follow us on Facebook, Twitter and Instagram. ZAGG Inc (NASDAQ:ZAGG) is a global leader in accessories and technologies that empower mobile lifestyles. The Company has an award-winning product portfolio that includes screen protection, power management solutions, mobile keyboards, and personal audio sold under the InvisibleShield®, mophie®, ZAGG®, BRAVEN®, and IFROGZ® brands. ZAGG Inc has operations in the United States, Ireland, and China. For more information, please visit the Company’s websites at www.zagg.com, www.mophie.com, and www.braven.com.